Concepcion Picciotto (born Maria de la Inmaculada Concepcion Martin; January 15, 1936 - January 25, 2016), also known as Conchita or Connie, was a Spanish-born peace United-States based activist. 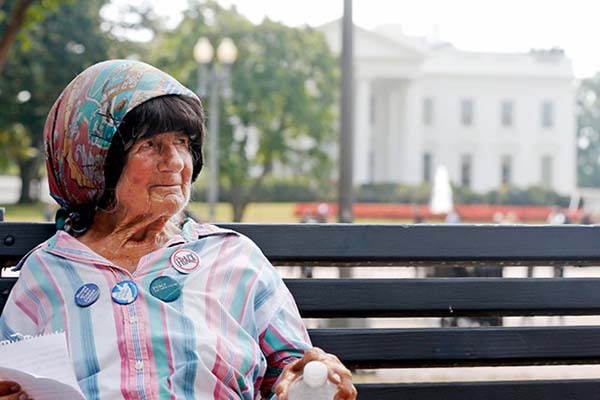 She lived in Lafayette Square, Washington, D.C. on the 1600 block of Pennsylvania Avenue, in a peace camp across from the White House, from August 1, 1981 in protest of nuclear arms until her death. Picciotto carried on the longest continuous act of political protest in the United States, with her camp having been nicknamed by her supporters as "1601 Pennsylvania Avenue". Eleanor Holmes Norton, Washington D.C.'s delegate to the House of Representatives, noted that many of Picciotto's goals were accomplished during her protest including a reduction in atomic proliferation. President Obama's closest neighbor died on Monday, just a few days after vacating the peace vigil encampment behind the White House that she had occupied for more than 30 years in what was considered the longest political protest in American history. The protester, Concepcion died in a Washington apartment she shared with three roommates not far from her Lafayette Square tent, said Schroeder Stribling, the executive director of N Street Village, which provides services to homeless women. Ms. Picciotto, who had been in declining health, had just turned 80.